Have you ever wondered about the benefits of bi-fold doors and what they can bring to your home and garden? Well, here we take you through the top 5 reasons to invest in bi folding doors. Bi-fold doors are superb at letting light into your home. When closed, they behave as a wall of glass which allows far more light into a room than a standard window or door. Not to mention, upon opening bi-fold doors they completely fold away, removing all barriers from between the sun and your home. 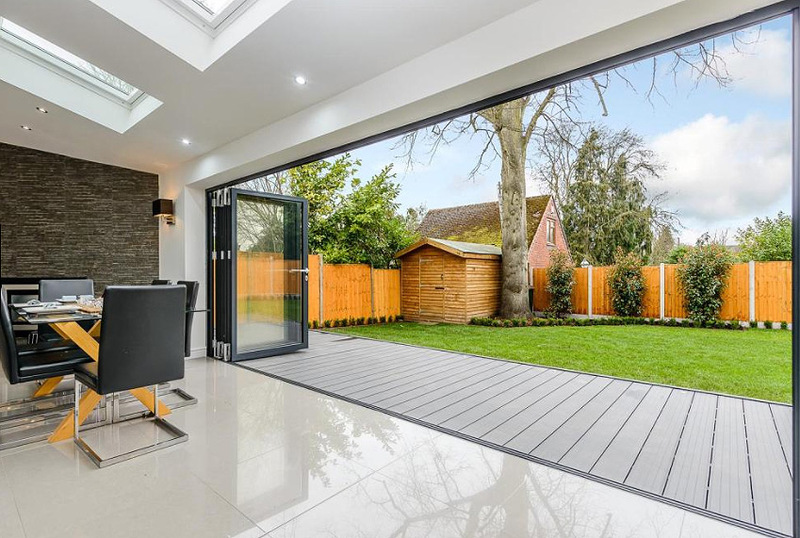 The difference that this can make to a space can be truly astounding, and clients often feel that their homes have been completely transformed by the addition of bi-fold doors. Lite Haus UK’s Schuco folding doors come with a ten-year guarantee because we know they’ll last far longer than their UPVC counterparts. Aluminium bi-fold doors perform much more effectively throughout the year’s seasonal changes. They won’t warp and bend in the heat. They’re also much less likely to split and look dirty. A clear choice for durability. For this reason, Lite Haus UK won’t supply UPVC products, because we don’t want to be associated with a product that is less than outstanding. Bi-folding doors have become a must-have addition to high-end interior design projects. Customers love them for the simplicity and sleek styling that they can bring to a space. What’s more, bi-folds are transformative. They can change from acting as a sleek glass wall to a wide gateway to your gorgeous garden. In addition to Schuco, Lite Haus UK supply and install Reynaers Aluminium and contemporary Lite-Style products. Each Lite Haus door is designed to be thermally insulating. There’s also the option of installing solar control glass. This will specifically help your room to be cool in the summer and stay warm in the winter. A great aspect of bi-folding doors is the way that they can completely fold away when opened up. This is incredibly effective at saving space in your home and looks very minimalist. This highly contrasts with UPVC french doors which have been popular in recent years. Each individual panel must open with these doors, which physically takes up a lot more space. Bi-fold doors in comparison neatly fold away to the edge of the frame. Enter your measurements into our online door designer and get an accurate quote for a bespoke folding door. We manufacture and install Schuco bi folding doors, Raynaers aluminium doors and Lite-Style folding doors so we have products to suit a range of budgets. If you need more help, give our team a call on 024 7646 0155 and we’ll be happy to go through your options in more detail.